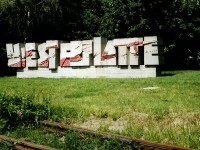 The history of old Warsaw is far from being all milk and honey: as people in Warsaw resisted German occupation in 1939, the city was heavily bombed – entire blocks were turned into ruins and thousands of people died. In the last few decades, the old center has gone through a massive reconstruction and restoration process. Much of the buildings you’ll have the chance to admire today are all the result of skillful and detailed reproduction: actually, you could swear that these buildings are several centuries old! The Old Centre of Warsaw or, how the Poles call it, Stare Miasto, is very rich in attractions off all types, from museums and theatres to fortresses and bohemian cafes. 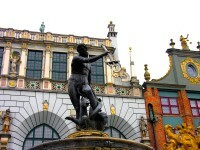 People usually stroll around the big Market Square, the Royal Castle and the Barbican. 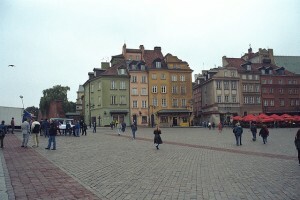 The Palace Square is dominated by the statue of King Zygmunt. There are also a number of very old and beautiful churches, like the St. John’s Cathedral and the Jesuit Church. The modern Warsaw itself represents an interesting mix of the contemporary, glass and steel buildings and the Stalinist heritage. Dominating the skyline of Warsaw you’ll find the Palace of Culture and Science, a monumental building which was built as a gift from USSR to the Polish people. 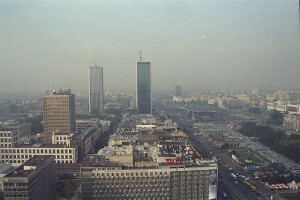 Several skyscrapers now surround the Palace of Culture, and very modern and innovative designs can be witnessed all over downtown Warsaw. The TVP (Polish National Television) headquarters and the Intercontinental Hotel are two of the most eye-catching constructions, as well as the PTT tower. Right in the center you will also find the Golden Terraces, an ultra-modern shopping mall with a more than daring design.